Poorly designed spaces give you anxiety causing a knee-jerk reaction to “fix” the offending mess. Your friends drag you along with them to various home-decorating stores to help pick out the perfect accessories, because you have better taste than they do. Your brain hurts from it always being picked in regards to helping make homes look nicer. Do these little scenarios sound vaguely familiar? Maybe it’s time to think about becoming an interior designer? Learn more about what interior design is, and what it takes to become an interior designer. Find a design program near you. Interior design creates solutions to problems within the four walls of a building. The concept of interior design is to enhance the interior of a space within a building, using a combination of art and design, with the result being the creation of a safe, and aesthetically pleasing environment for the client, whether it is a residential or business environment. Interior design goes beyond the visuals of the interior of the structure; design also focuses on the conceptual as well as technical values of a space. COULD YOU PICTURE YOURSELF DOING THIS ALL DAY? There are two main types of interior designers: Residential and Commercial. Residential interior designers work with homeowners to design their living spaces. Some interior designers may specialize in particular rooms such as kitchen and bath, or bedrooms. Commercial interior designers work on government buildings, schools, corporate spaces, and other public-facing buildings. Within the Commercial Interior Design sector, specialties can be broken down even further; kitchen and bath, hospitals, hotels, and restaurants, are just a few sub-specialties of commercial interior designers. Very often the job of interior designer and interior decorator are used interchangeably. However, there are major differences in the two. The main difference is; interior designers can decorate, but interior decorators do not design. Interior designers are involved in projects from the ground up. Interior decorators are not, their focus is solely on the furniture and the materials that embody their clients taste, and they decorate the space as such. Also, interior decorators do not require formal education, interior designers do. Interior decorators go through extensive schooling, learning everything from history to computer guided design programs. Interior decorators, while their taste may be impeccable, are not as heavily educated in design. DO YOU HAVE THE SOFT SKILLS? To be a successful interior designer, you should possess certain personal skills and qualities. Interior designers may get to play with fabric and colors but, at the end of the day, there is so much more that goes into the job of the interior designer. Communication is key. As an interior designer, you’re going to need to have to work effectively with not only the client but the professionals being brought in to work on the project. Creativity is crucial. Let’s be honest here; interior designers are creative by nature. Sure, much of the process can be learned. But, it takes a creative person to create. Artistic ability is a major asset. To be able to create an aesthetically pleasing environment, interior designers have to have artistic talent. Devotion to detail. Interior designers spend their lives noticing every minute detail from the color of the hinges on the doors, to the wood grain, to the spacing of the ceiling beams, and everything in-between, around, and through. Mystical mind-reading. Let’s say it the way it is, not all clients are going to know what they want, they just know that want something. It’s up to the interior designer to extract what information they can, even if it’s by reading body language, or interpreting nonsensical words, and come up with a wow-factor plan. Professor of problem-solving. One thing is guaranteed, problems will arise for an interior designer. The wrong materials, construction delays, unavailability of items, higher than expected costs; all these are just snippets of problems that can arise. And, it’s up to the interior designer to sail through these and come up with solutions. Earn your degree from an accredited interior design program. Pass the licensing exam given by the National Council for Interior Design Qualification (NCIDQ). Continue your education through avenues such as courses, intensives, and conferences. 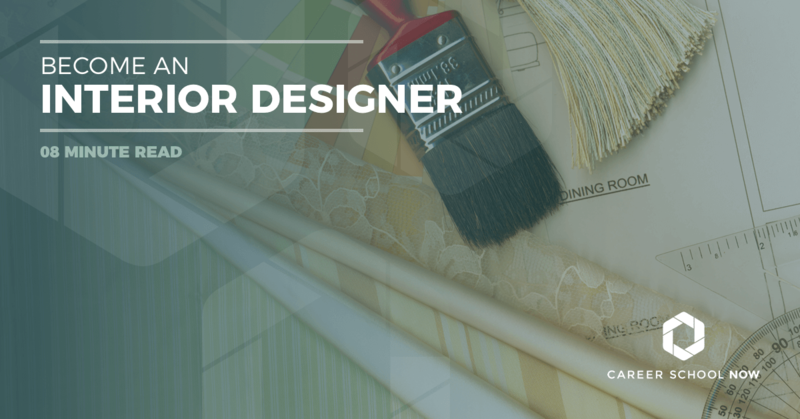 There are a few different degree paths for budding interior designers to take. Associate’s degree and bachelor’s degree are the most common. Nowadays, most interior design firms are looking for bachelor’s degree holding interior designers. So, a four-year university is probably the best bet. However, after the first job, it’s usually not your degree but your experience and portfolio that will get you in the door. Associate’s of Arts Degree: Associate’s degrees are designed to take two years to complete if the student attends full time. In an interior design program, students will take courses in the fundamentals of design (both by hand and computer), digital drafting, lighting, color theory, furniture design, art history, and a variety of business courses. Bachelor’s Degree: An associate’s degree can be applied toward a bachelor’s degree. The bachelor’s degree typically takes four years to finish. Bachelor's degree programs are a more well-rounded, as the student takes classes in areas beyond their major. Most accredited bachelor’s degree programs will include courses such as design theory, textiles, business, 3-D imaging, and space planning. College can be expensive, and interior design is no exception. Typically, associate’s degrees are a fraction of the cost of bachelor’s degrees. The average cost for a 2-year degree in interior design is $8,000, while a bachelor’s degree can be well over $30,000 annually (that’s including living on-campus and purchasing books and supplies). Attending an in-state university can significantly cut down the cost of the ever-rising college tuition. Also, public schools can be much less expensive than private, but both types offer financial assistance to those who need it. Have a conversation with the financial aid department of the chosen interior design program. To learn more about general financial aid, please read this article. Make sure the interior design program is accredited through Council for Interior Design accreditation. Check to make sure the school offers the degree you’re looking to get whether it’s a Bachelor’s of Arts (BA), Bachelor’s of Fine Art (BFA), or Bachelor’s of Science (BS). Does the school teach computer-aid drafting (CAD) and provide formal training? Are internships and apprenticeships available? Does the program align with your goals? Do you want to specialize and does the school offer that area of specialty? What is the employment rate of past graduates? Through 2026, there is projected to be a 5 percent employment growth for interior designers. This growth is average in comparison with all other occupations. Working in affluent areas will increase the chances of getting higher paying clients. Interior designers work can be affected by the economy, as with most other construction related careers. The median annual wage for interior designers is $49,810. Entry level interior designers earned over $26,000, while those in the top 10% of the interior design industry made over $91,000 annually. Interior designers usually work full-time, and they have to accommodate their clients so their work schedule may be inconsistent. Every state has its own licensing requirements for interior designers. However, many interior designers, upon finishing their education, choose to become licensed regardless of their state’s requirements. Potential clients, as well as interior design firms, may show preference to interior designers who are licensed. The most commonly used exam is from the National Council for Interior Design Qualification (NCIDQ). California’s exam is different, the state uses one given by the California Council for Interior Design Certification (CCIDC). Both exams have an educational and experience requirement prior to being able to sit for them. Note: The Michigan State Board of Architects keeps a list of qualified interior designers.